Some time ago I decided to make a dress based on a gorgeous Mary Magdalene design. It's the most ambitious project I've tried so far especially since I also wanted to draft the whole pattern from scratch. So this is how far I've got. 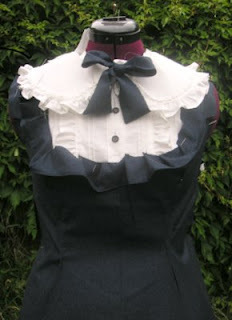 Everything is just pinned together in the picture but I've cut most of the pieces and made a start on the bib and collar. All the fiddly pin tucks and smaller ruffles are done. There's also masses of ruffles still to make for the skirt. I best get back to work! @Cindy - I can have a go. I'm not sure I always do things 'properly' technique-wise but I can show you my way.